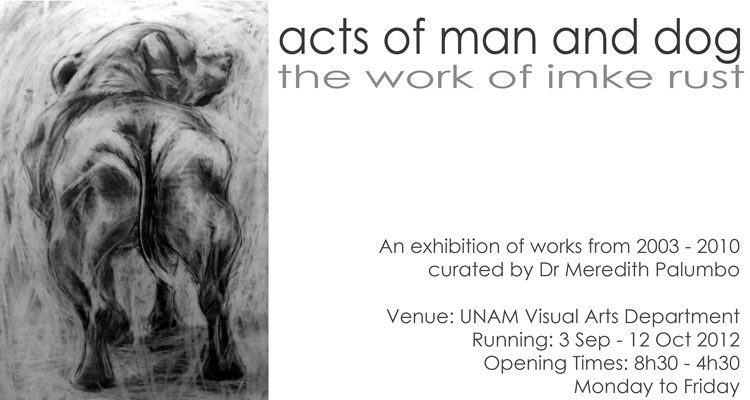 If you are in Windhoek and would like to see some of my artworks (older ones – but some I am sure you have not seen yet) try to make a turn at the University of Namibia Campus – Visual Arts Department, where a selection is currently on view! It is not an official exhibition, so there has not been a special opening function etc. but was meant to introduce the UNAM students to my work. Fortunately the exhibition is open during normal university hours for the public, too. Should you be interested in buying any of the works, please contact me, so that I can give you the prices and details. (Not all works are for sale, but most of them). I hope you enjoy seeing this exciting mix of my older work! This entry was posted in Exhibitions, Painting and tagged art, dog, exhibition, figure, imke rust, namibia, namibian, UNAM, University of Namibia, Windhoek on September 12, 2012 by Imke Rust.